DFDS Seaway's ships sail from the Internatinal Ferry Terminal, Royal Quays, North Shields which is situated approximately 8 miles east of Newcastle City Centre and is signposted with the "International Ferry" symbol. From the City Centre: Take the A1 towards Morpeth and then the A19 towards the Tyne Tunnel. 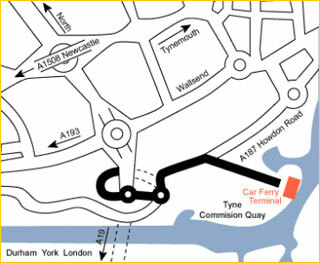 On Approach to the tunnel, follow the International Ferry symbol onto the A187 towards North Shields. Continue along this road to the roundabout, take the second exit to the International Ferry Terminal, Royal Quays. Passengers from the North: Head for the Tyne Tunnel via the A19, then follow directions as above. Passengers from the South: Approach via the A19 towards the Tyne Tunnel. Once through the tunnel join the A187 and proceed as above. Please Note: Drivers approaching from the South should allow extra time during the summer months when the tunnel can be extremely busy. The elegant canal houses, world famous art galleries and buzzing cafes can all be seen in this exciting city. 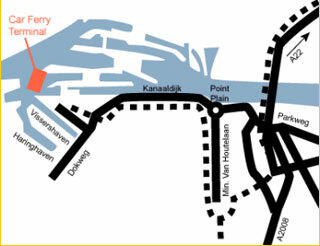 Directions to Amsterdam Ijmuiden Ferry port by car. Take the A9 (travelling from Amsterdam, The Hague, Haarlem or Alkmaar) and turn off at the junction Ijmuiden, Beverwijk (to A22). Follow the sign to IJmuiden and turn left at the traffic lights. Continue following the signs to IJmuiden. Please be careful to watch your speed. The limit is 50kmph and there is frequent speed control. From the Pontplein (ferry to Velsen Noord/Beverwijk) follow the Kanaaldijk (Canal Dam) along the North Sea Canal (on your right hand side) and the sign to the NEWCASTLE. At the junction of Kanaaldijk and De Geul, follow De Geul, underneath the viaduct. You'll then arrive at the Dokweg. Follow the Dokweg and take the first road to the right (at the Shell station). Follow the Halkade which leads you to the Felison Terminal and the DFDS Seaways ship. If art is your interest there will be plenty of options as well with the well-know Dutch masters of painting such as Rembrandt, Van Gogh, Mondrian etc. With whichferry.co.uk you can book your ferry for your next trip to Holland. Our popular ferry routes to Holland include; Harwich to Hook of Holland (Harwich to Hook van Holland) with Stena Line Ferries, Hull to Zeebrugge and Hull to Zeebrugge (Belgium) with P&O Ferries. A Ferry to Holland will take you there to explore all of the above. Explore Holland by car, on foot, by bicycle or on horseback. Explore Holland with whichferry.co.uk. Our ferry routes include; Harwich - Hook of Holland, with Stena Line Hull - Zeebrugge and Hull - Zeebrugge in Belgium with P&O North Sea Ferries. You can also use the ferry service Newcastle - Amsterdam with DFDS seaways, or take the Dover - Calais route (Via France).